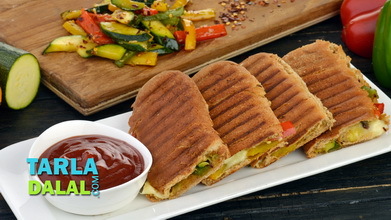 A sumptuous omelette made of a batter of besan dotted with chopped tomatoes and flavoured with spice powders is made all the more satiating by sandwiching it between bread slices layered with peppy green chutney and sliced veggies. 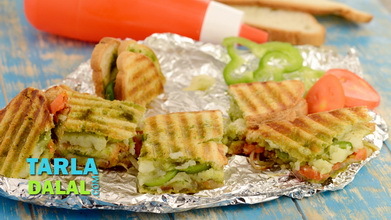 This unique Vegetable Tomato Omelette Sandwich, with its excitingly different texture and flavour, gets a peppy boost from a sprinkling of chaat masala, which makes it a totally irresistible snack that fulfills your palate and your tummy! Combine all the ingredients with approx. ½ cup of water in a deep bowl and mix well to make a batter of pouringconsistency. Pour a ladleful of the batter on the tava (griddle) and spread in a circular motion to make a 125 mm. (5”) diameter circle. 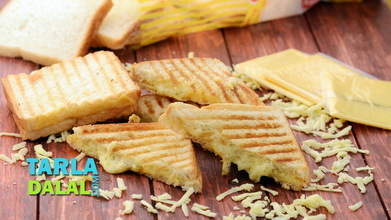 Cook on a medium flame, using a little oil, till golden brown spots appear on both the sides. Repeat steps 4 and 5 to make 3 more tomato omelettes. Cut each tomato omelette into 4 equal pieces and keep aside. 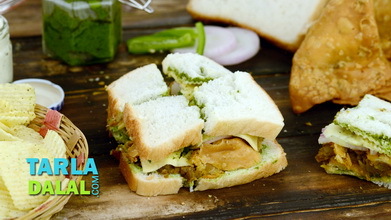 Apply 1 tsp of butter and ½ tsp of green chutney on 3 bread slices. 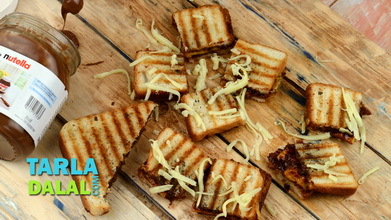 Place a slice of bread, with the buttered-chutney side facing upwards, on a clean and dry surface. 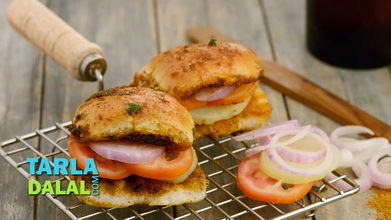 Arrange 4 potato slices over it and sprinkle little chaat masala evenly over it. 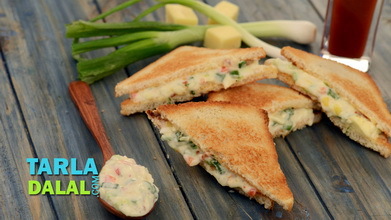 Arrange 4 cucumber slices evenly over it and place 1 onion slice in the centre. Again sprinkle little chaat masala evenly over it and place another bread slice over it, with the buttered-chutney side facing upwards. 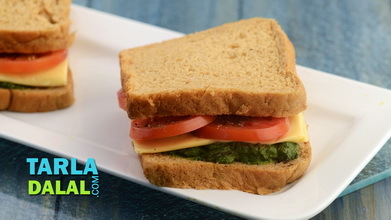 Arrange 4 tomato omelette pieces evenly over it, cover it with another slice of bread with the buttered-chutney side facing downwards and press it lightly. 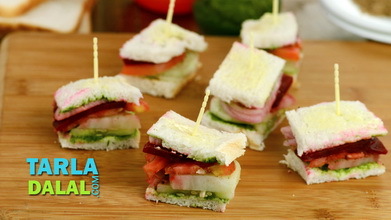 Cut the sandwich diagonally into 2 pieces using a sharp knife.